Top rated on Tripadvisor. Check out what everyone is talking about. Disc Golf started in the 60’s in California. It’s been growing ever since. It’s a simple concept get the disc in the basket. Do it in less throws than your friends and you win. It’s fun for families. It can be competitive with friends. 9 holes to challenge yourself. 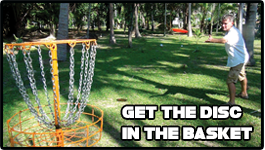 We have multiple tee locations for each hole (kids, beginners and advanced.) Every hole is Par 3. It’s a great day for everyone and for every skill level. Take a tour of our course. We had Google come down and take a few pictures. It works just like street view. It is partial look of our course but it gives you a good idea of what it looks like. We have an American snack stand at the club house. Enjoy our great home made pizzas, wings, meatball subs and sandwiches. If you have a large group and want to have a BBQ, give us 24 hours and we can arrange that for you. We also run a catering business here. Take a look at Nigel’s BBQ – Samui Catering. We also have plenty of cold drinks. We have leagues on Monday and Wednesday. Registration starts at 3:30. We tee off at 4pm. We shotgun start so it is better to come a little early. We tend to have food specials on Wednesday. The price includes a frisbee.